Then we set “Selected DTM” to “All DTMs” and “Reference DTM” to the surface approximation DTM, named “Template” in this example. 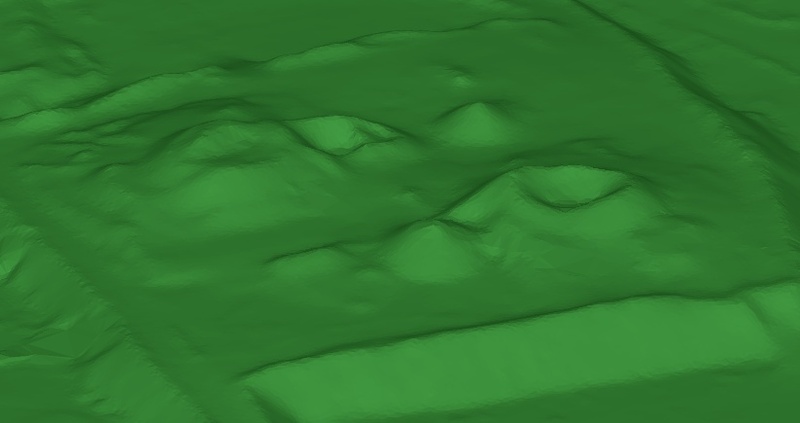 Then we decide: what is the maximum vertical distance that the actual surface could be from our reference DTM? This is important because the next thing we are going to do is remove any point in any DTM that is greater than this distance away from the reference DTM. The ideal value to use is a distance that is greater than the largest possible distance from the actual surface to our reference DTM, but is also smaller than the smallest possible distance between the infrastructure and the reference DTM. If we pick a value that’s too small, we may lose some of the terrain. If we pick a value too large, we may not remove some of the infrastrucutre. In this case I’ve decided to use a value of 2 m because I know my reference DTM follows the terrain pretty closely, and I also know that with aerial photography you tend to get points on the ground and points on top of the infrastructure (which is well above the ground — about 20 m in this case), but relatively few points on the infrastructure close to the ground simply because of the vantage point. Once complete, the software will give a report on the number of points that were removed, the RMS difference between the points that were retained and the template, and the number of points that were removed because they were outside the reference DTM footprint (which will be 0 unless you checked “Removed external”). One of the motives for removing infrastructure from DTMs is to calculate accurate stockpile volumes, and to do that, you need to actually merge the individual DTMs into a single DTM. Before merging, however, it’s worth visiting the DTM Filtering dialog again. Whenever we create 3D data in the real world, there is always some error associated with that data. As explained in earlier posts on accuracy, we can predict the accuracy beforehand, but that accuracy is the accuracy of individual points in a single model. When we do a project with aerial strips, like we do with stockpile volumes, we can use many combinations of images to generate DTMs from many different vantage points, all with significant degrees of overlap. This is great for allowing us to see “underneath” infrastructure, but it also allows us to increase the accuracy of the data beyond what the simple calculations show, because now we have multiple samples of the same surface — a single point on the ground can easily be covered by five or more DTMs! It makes sense to try to take advantage of these additional observations and increase the accuracy of the surface model, and the DTM Filtering dialog includes functionality for just that purpose. The distance figure has the same meaning as before, but with a twist — previously we assumed that the reference DTM was correct and if there was a point further from it than the specified distance, that point must be in error and was therefore deleted. Now we don’t know automatically which point should be deleted if another DTM gives a height that is more than the given distance away from the point under consideration. If another DTM gives a height at that location that is more than the specified distance away from the point, the point is not marked as valid and the height supplied by that DTM is not used as part of the weighted average calculation. If another DTM gives a height that is less than the specified distance away from the point, then the point is marked as valid and the height supplied by that DTM is used as part of the weighted average calculation. If no other DTM gives a height for a point (i.e. they do not overlap) then it is marked as valid. This allows DTMs to be reconciled and their surfaces to be moved towards each other iteratively without “bad” points (e.g. points on infrastructure) affecting them. One other tip: if you hide a triangle, it won’t be used for reporting a height. 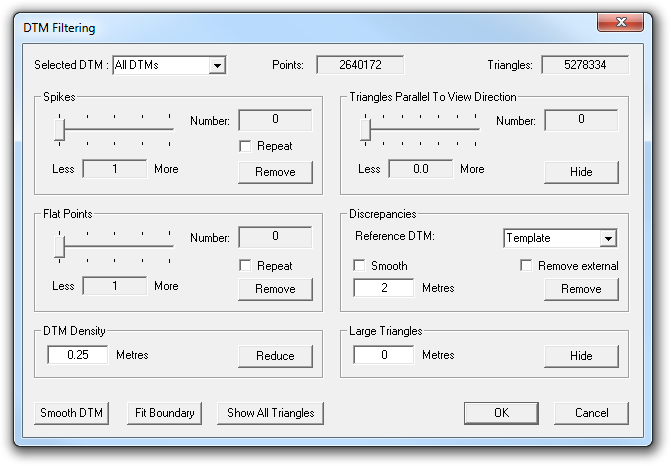 The DTM Filtering dialog includes an option to hide triangles greater than a given size. Since a large triangle is less likely to accurately represent the surface within its extents, you can type in a size under “Large Triangles” (e.g. 10 m) and click on “Hide”, and prevent those triangles from contributing to the height adjustment. Notice how the names of the DTMs are derived from the names of the images? Notice also how 90-92 form one model, 91-93 the next, 92-94 the third, and so on? Since these images were captured in a strip, this guarantees that at least two DTMs will cover any given point, and generally many more than two DTMs will. This is all very well and good, but it does seems rather dependent on this magical “surface template” DTM, doesn’t it? Where did that come from? Believe it or not, the DTM Filtering dialog comes to our rescue once again! Suppose I had a collection of DTMs representing my stockpiles consisting of a few million points, and I wanted to clean up those DTMs to remove the infrastructure by hand. What’s the big obstacle to doing that? It simply takes a really long time to edit all those DTMs because there are so many points in so many different locations that need to be deleted. What if there was a way to dramatically reduce the number of points so that we had to delete, by hand, maybe only a dozen or so? More importantly, suddenly the points on our infrastructure start to look a lot more “spikey”. This is important, because the spike removal feature in that same dialog, which is designed to remove bad points, will now start to think that the points on the infrastructure are bad because they are isolated. (Normally it’s useless for removing points on infrastructure because there will tend to be many points close together on the infrastructure; this is because the points aren’t bad — i.e. incorrectly matched — but are merely on surfaces that are unwanted.) Therefore we can do a Spike Removal operation (preferably with the “Repeat” option checked) on our filtered DTMs and suddenly a large part of our problem disappears. We can then remove discrepancies with smoothing, exactly as described above, and it will be much, much faster because so few points are involved. And, finally, we can edit the merged DTM by hand to clean up anything that was left behind. That’s how the low-resolution “template” DTM was created, shown near the top of this post. All up it should take only take a few minutes. Of course, if you lower the density too much, you will need to be more generous in your distance setting when using the template to filter your original DTMs, because the lower density DTM won’t capture the peaks and troughs as well and points on the ground can legitimately be further away from the template DTM, which also increases the risk that you might not be able to filter out the infrastructure as easily. The DTM Filtering dialog contains some simple but powerful tools, that become even more powerful when used in combination. The Spikes section normally allows you to remove bad DTM points but can, with judicious use of the DTM Density setting, also filter out a lot of the infrastructure as well. 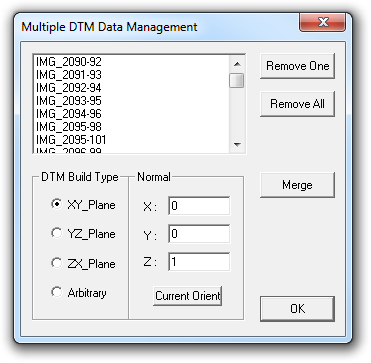 The DTM Density section likewise can have a big impact on the amount of time and effort required to process some data. The Large Triangle hiding section allows you to eliminate triangles that are likely to be suspect. And, finally, the Discrepancies section can filter DTMs with respect to a reference DTM, can remove the discrepencies between overlapping DTMs, and remove points that lie outside the footprint of a reference DTM. One more button worth playing with is the “Smooth DTM” button, especially when creating the template. It can be pressed multiple times, each time making the DTM smoother — just don’t press it so many times that the surface loses all detail! This entry was posted on 1st April, 2011, 2:46 pm and is filed under FAQs, Tips. You can follow any responses to this entry through RSS 2.0. Both comments and pings are currently closed.